After many attempts over the years, I finally have perfected my Tandoori Marinade. Use it with meats or grilled vegetables. I don’t eat much meat so use this when I grill my vegetables. There are 15 dry roasted organic ingredients! To make this a perfect Chicken Tikka, use Trudy Ann’s Tandoori Marinade along with her Chicken Tikka Masala. Preparation: Mix 1 pound meat (or vegetables) with 1 TBsp Tandoori Marinade, 2 TBsp Garlic, 1 TBsp Ginger, 1/4 Cup Yogurt, 2 TBsp Lemon juice. Bake until tender. Baste with butter. Variation: Add 1 teaspoon Tandoori Marinade to 1/2 C plain yogurt. Use as dips, marinades, salad dressings or add to food to enhance flavour. Add salt to taste. For Tandoori Roast Chicken recipe look at Trudy Ann’s recipe blog. The Tandoori Marinade is amazing. I bought the mixed boxes of Trudy Anns spices and gave one box to my family for Christmas. 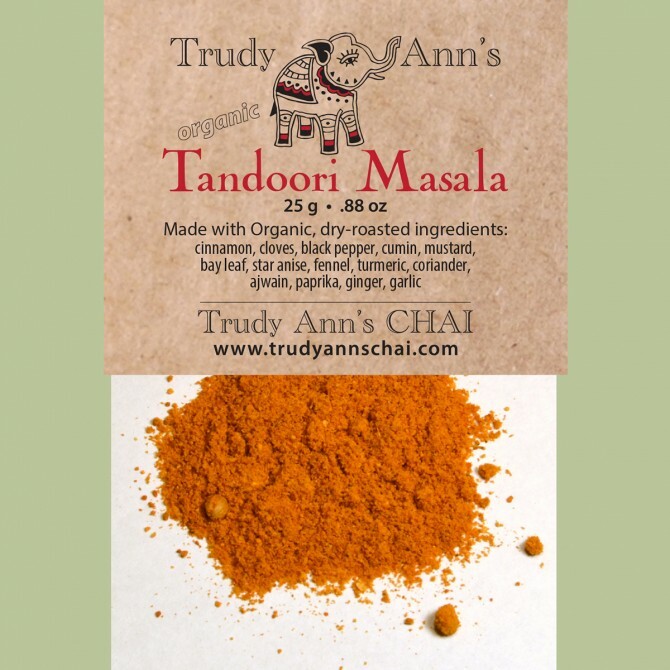 Scince I know some recipes from Trudy Ann we changed our usual Christmas dinner to Trudy Ann’s Tandoori Style Roast – so yummy. Now my family is addicted to the marinade. I can highly recommend the Tandoori Marinade with chicken.